With the appointment of a task force that has representation from Canada and Mexico “to make this special again,” the federation wasted no time in focusing on it. The annual competition offers young people involved with show jumping, dressage and eventing an opportunity to get a taste of riding on a team, building a bridge for those seeking to reach the higher levels of their sport. What originally was the North American Young Riders Championship began in 1974 as an eventing challenge between the U.S. and Canada. Dressage was added in 1981 and show jumping became part of the competition a year later. The first championship hosting all three disciplines was staged in British Columbia in 1982. In 1985, it went to Tempel Farms in Illinois, which hosted it 13 times into the 21st century, and the championship moved around in succeeding years. The messy acronym, NAJChYRC, has been smoothed out. It’s now the Adequan/FEI North American Youth Championships, presented by Gotham North, the farm of Georgina Bloomberg, who won the individual Young Riders show jumping gold in 2003. She believes strongly in the event that also provided a star turn for other riders who went on to greatness, such as Greg Best, Karen O’Connor and McLain Ward. One ambition that hasn’t been realized is putting all three disciplines together again in the same location, which happened at some previous venues, including the Kentucky Horse Park, the Colorado Horse Park and Tempel Farms. As was the case last year, the eventing portion will be held July 18-22 in conjunction with the Event at Rebecca Farm in Montana. Show jumping and dressage, set for Aug. 1-5, have been moved from the 2017 venue of the HITS facility in Saugerties, N.Y., to Old Salem Farm in Westchester County, N.Y.
“Despite Tom Struzzieri doing a beautiful job of organizing some sport and generously giving parties [at Saugerties], it didn’t feel like a championship to me anymore,” said Murray, noting it was running at the same time as a regular horse show. “A lot of the things that made it feel special were gone. They couldn’t even fill a Zone 2 [jumper] team. I hearken back to my daughter [2012 Olympian Reed Kessler] fighting all year to try to qualify for the Zone 2 Young Riders Team. It was a neck-and-neck race and there were 10 or 12 candidates.” In 2017, “they couldn’t fill it [from Zone 2], and had to join it with another group. “I left there more than disappointed. When you went on the Facebook page, it said, `Welcome to Colorado’ and it was [actually] in Saugerties,” sighed Murray. The jumper portion once was a destination competition boasting strong teams from around North America. It has been diminished because so many young people are showing in Europe or Spruce Meadows during the summer. In an effort to counteract that, $50,000 is being offered for the Junior jumping championship and $75,000 for the Young Rider portion. “It’s never had a dollar of prize money,” Murray commented, who thinks the purses will make a difference. Howard Simpson, who was involved with Young Riders when it was at Tempel Farms, said that facility used to give away “funny money” for points, rather than real cash. So will the other improvements USEF has planned. “It will be all live scoring, Facebook pages are ready to go, we have the return of things as simple as credentials,” said Murray. “We’re printing signage,” commented Murray. “When you drive in to Rebecca Farm or Old Salem Farm, you’ll know you’re at a championship. 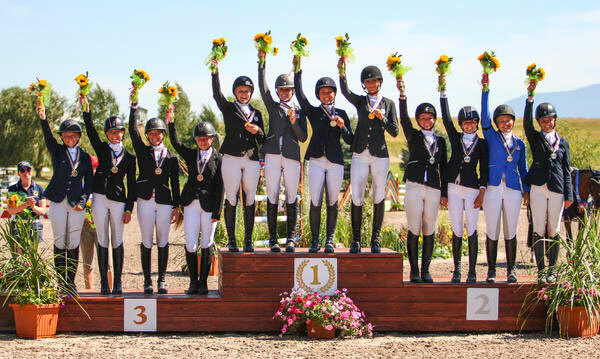 It will say, `Welcome to the North American Youth Championships.’” USEF is trying to obtain year-long sponsorships from corporate partners for the winners of the gold medals, and career forums are also on the agenda. Howard, who worked with his wife, Martha Smith Simpson, and her sister, Linda Smith Buonanno, at Tempel Farms, basically saved the event when they started hosting it. “They could have gone tennis or basketball, but equestrian was so important to them because it’s such a training for life values,” said Howard.